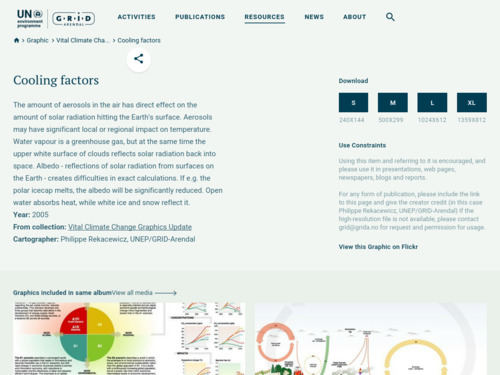 This qualitative graphic illustrates the various factors that affect the amount of solar radiation hitting or being absorbed by Earth's surface such as aerosols, clouds, and albedo. 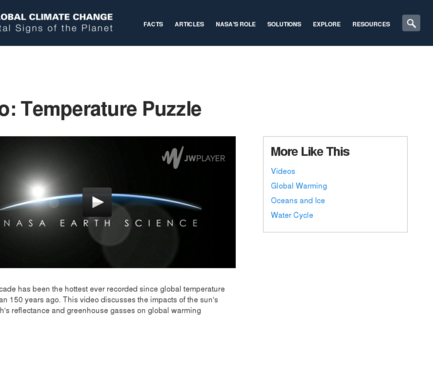 This lesson is a lab in which students use thermometers, white and dark paper, and lamps to measure differences in albedo between the light and dark materials. Connections are made to albedo in Antarctica. 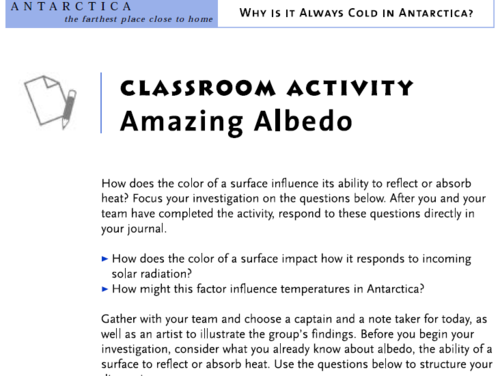 This activity teaches students about the albedo of surfaces and how it relates to the ice-albedo feedback effect. During an experiment, students observe the albedo of two different colored surfaces by measuring the temperature change of a white and black surface under a lamp. 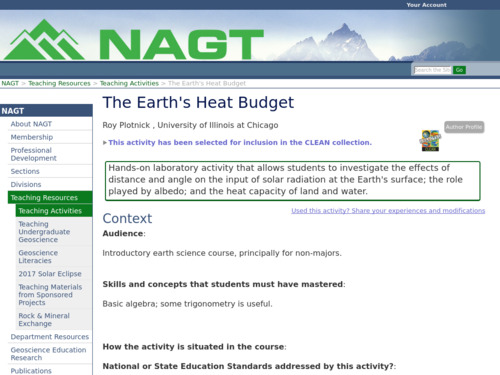 Hands-on laboratory activity that allows students to investigate the effects of distance and angle on the input of solar radiation at Earth's surface, the role played by albedo, the heat capacity of land and water, and how these cause the seasons. Students predict radiative heating based on simple geometry and experiment to test their hypotheses. 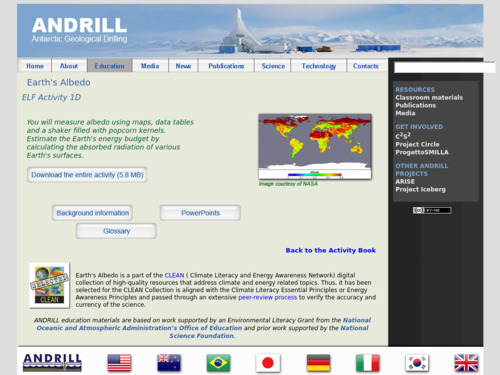 This engaging activity introduces students to the concept of albedo and how albedo relates to Earth's energy balance. 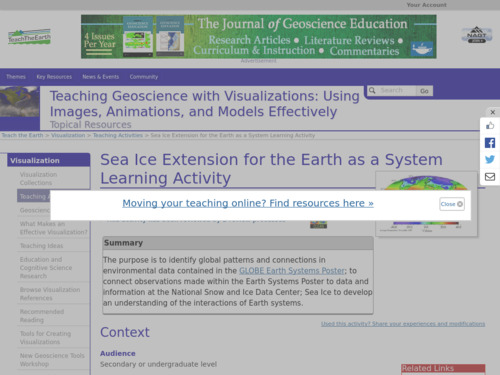 What is Ice Albedo Feedback? 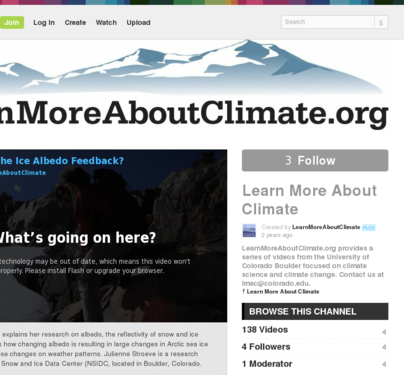 This video provides a good overview of ice-albedo feedback. 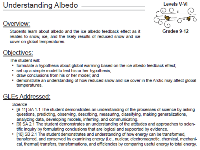 Albedo-Climate feedback is a positive feedback that builds student understanding of climate change. 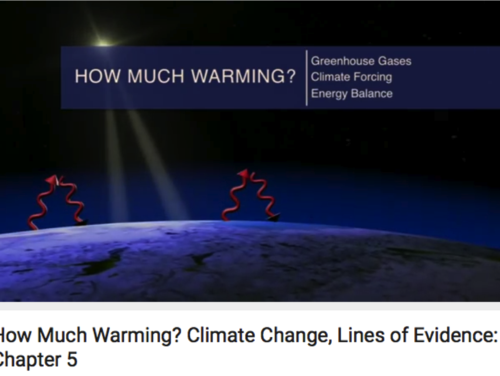 This NASA video discusses the impacts of the sun's energy, Earth's reflectance, and greenhouse gases on the Earth System. 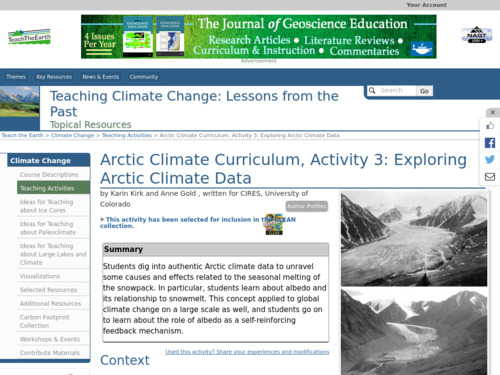 In this activity, students use authentic Arctic climate data to unravel some causes and effects related to the seasonal melting of the snowpack and to further understand albedo.